Cubicle lifestyles have given rise to a range of health issues. Working in varying postures throughout the day alleviates some of these symptoms. 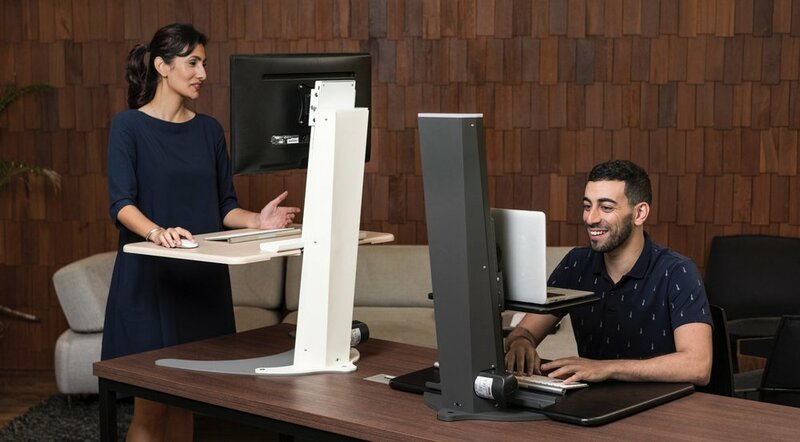 Altizen enables users to seamlessly transition between sitting and standing postures, without compromising on human factors. With a stroke length of 50cm Altizen is adequate for heights ranging from (1.4m ~ 2.4m). The small footprint (50cmx70cm) is designed for offices with limited desk space and installation hurdles, no clamps or mechanical fixtures are required for use. It can accommodate a wide range of configurations from tablet pcs, laptops, all-in-one computers to multiple monitor desktops. Sensors embedded in the unit coupled with data from the activity ecosystem (wearables) track, presence, activity and productivity. that can be installed on any flat surface. catering to the widest range of heights. for a mobile or stationed worklife. and use it to formulate sit/stand routines. Due to the mechanical nature of this project we began prototyping our concepts from day one to quickly visualize scale and stiffness. Our aim was to answer the question “how stiff is stable enough”? We felt the only way to answer this was to get working prototypes into users hands as soon as possible.